Yes, another vacation post, but this is a good one! Earlier this spring I made a very simple and very delicious strawberry cake. A few weeks later, I made another. I was looking to make a very simple and quick cake for company and after an internet search, I found myself looking at this recipe. It was called the easiest cake ever, so really how can you go wrong? If you think that easy means that it also skimps on taste, you are dead wrong. This cake is delicious! I used strawberries because it was the end of May and ripe local berries were in season. But this cake would be delicious with blackberries, boysenberries, raspberries, nectarines, peaches and even plums! It requires only 1 bowl so the clean up is easy too. Really, what are you waiting for? Preheat oven to 350F. In a large bowl, combine the flour, baking powder, and lemon zest. Add in the sugar, eggs, vanilla and oil and mix to combine. Butter and flour an 8 or 9 inch cake pan and add in batter. Batter will be quite thick, so use a spoon to smooth out the top. Drop in strawberries, pressing them into the batter. Sprinkle with raw sugar. Bake for 50 minutes to 1 hr or until a cake tester inserted comes out clean. Ooh, this looks like an ideal BBQ food. And would be just stellar with wee cylinders of banana. The PRETTIEST cake ever – looks fabulous. i think i have a new thing to add to my baking list this weekend! Yum! It reminds me of a recipe a friend of mine used to maje with half a cup of yogurt. This looks great I have to try and make it! For an Australian, what does 'T' mean? Teaspoon? Tablespoon? … is it T = Tablespoon, t = teaspoon? And I intend to make this cake soon. Oh, how I love simple cakes like this one! With all the berries floating around Quebec—not literally, of course—I can add this to my repertoire! That is one beautiful cake, and easy too. I have to try this one. wow i would have to try this. it's definitely, a very easy cake !!! So which other soft fruit would you recommend, besides strawberries? I made this for a BBQ the other day with some leftover plums and it was a huge hit! It is absolutely fabulous – thanks for the newest addition to my repertoire! I love how moist it looks! Oh yes, the easiest cake ever, and I screwed it up! ha! I forgot the oil, even though I had it out on the counter and everything. But, for future reference, it actually turned out just fine, its just crispy on the edges (in a nice way) and luckily I checked on it after 35 minutes and took it out just in time. I used cherries on mine and it was good. 🙂 I'll try it again sometime when I remember the oil! Love that this is made with canola oil! It's in the oven as I type this! Can't wait to dig in! By the way, it's blackberry season and this looks like the perfect cake to use up the 3l of berries I picked this weekend. hey I made one just like it just last week, but I did not drizzle anything over the berries, aha – this one is so much prettier, I will do that next time, cheers! This looks really good – and colourful! It would be great to bring to a potluck or something. And I'm sure you could sub in any berry, too! I just found your blog today through foodtv.ca, and had to try this cake. My variation: brown sugar, nectarines, and 1/4 cup of milk to thin out the batter a bit. Normally I would have reduced the sugar but the nectarines are pretty sour so I left it alone. Also, I baked it for only 30 minutes in a bundt pan, with the convection fan running (because I like to play with the fan, company was on the way, and I don't have a round pan). I'll be sure to make this again! I just made this cake and it is incredible!!! I used fresh, in season peaches as well as beautiful blueberries. Just amazing! My husband had 2 helpings! I love all the lemon zest in it. This is a keeper for sure. Thank you so much for this great recipe. I just made it but used orange zest and studded it with sour cherries in from a jar. Only because that's all I had and was craving cake! As I was putting the ingredients together I realized that I was out of canola oil so I used 1/4c grape seed oil and 1/4 melted butter. It still turned out pretty yummy. Love the crunchy topping. I made this gorgeous cake with blueberries and black berries. I added brown sugar and cinnamon and mine only took about 20-30 minutes to bake. I wonder if I did something wrong. It tastes delicious. I covered the cake in a basic powdered sugar icing with cinnamon. Elaine, it is perfect summer party food! I'm not a banana fan, but enjoy! Thanks so much Apple Hill! Steph, it is wicked simple. Thanks! Siescierto, it's very similar to a yogurt cake (I've got a few of those recipes here), but this is just as simple and just as tasty. Living, T means Tablespoon and t= teaspoon. It's my lazy shorthand. Kali, there's definitely great berries in Quebec. I'm jealous. Tasty Health, yes, give it a go. Karencilla, I'd try this with any kind of berry or stone fruit. I'm sure this would be amazing with peaches and a bit of ginger thrown in. Betsy so glad you loved this! Plums would be so good in this. Thanks Patricia, it's a keeper. Haha, at least your screw ups didn't ruin it! That's just how easy and impossible to screw up it is!! Too funny, Soon, Then! Julie, raspberries and rhubarb would be so good in this. Anon, enjoy with the blackberries! Kristiln, yes, it's easy to sub in any kind of summer fruit. 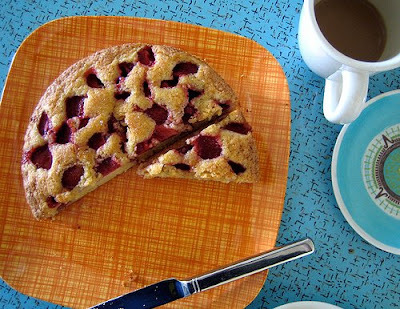 Foodmathquilts, yes, in a bunt pan would be beautiful! Glad it worked out for you. Yay, anon, so glad you enjoyed it!! Anon, I love the idea of using sour cherries! Too perfect. Judy, I'm sure you did everthing right. My oven is old so the times may be a bit off. I don't have it calibrated. Glad you enjoyed it. I can't wait to try this one! Thanks! Looks super moist and heh it's a one bowl recipe. Just my cup of tea. Thanks Maria, it's a good one! Jo, that it is. Enjoy. 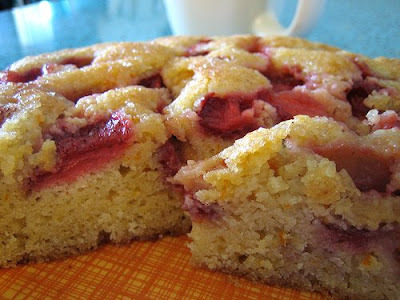 i just made it with plums instead of strawberries, and it is so good i have to keep myself from eating the whole thing ! thank you lemon zest ! I know I'm a little behind the times here, since you posted this in August and it is now October but… it was just as easy as you said it would be and just as delicious. I have passed the recipe along and I have made it four times – three times with prune plums and once with apricots. I'm about to try it with apples. I love your blog. Your intros are unpretentious, your recipes accessible on a day-to-day budget and time frame, and your pictures make me feel like I've tasted the item before I even make it. Thank you for all the effort you put into this. I understand why you won your award! waterloosunset, so glad you loved it! longbonyfingeroftheuniverse, wow, I think you just put tears in my eyes! Thanks so much for your comment, it made my day. I made this cake last night and it really was easy. After prepping the fruit and laying out the ingredients, it was literally 5 minutes before it was in the oven. No mixer required. I had some super juicy and ripe white nectarines lying around and used those. I used 1/2 cup sugar and 1/4 cup brown sugar, and added a splash of vanilla and sprinkle of cinnamon. I wasn’t sure about the cake right out of the oven but after letting it sit overnight, it was perfect. Not too sweet, not too heavy or light. And super moist! I brought the rest to work today and it was gobbled up quickly. People came back for seconds and thirds. Next time I won’t skimp on the sugar on top. It adds a great crunch and really wasn’t too sweet. Thank you for the recipe! I love your blog and have been following it for quite some time. And I will definitely be making this cake again and again.